Nearly two years ago, award-winning videographer and editor Tom Zwemke offered to film, edit and produce promotional videos for the JFK project. The result was a magnificent video which can be seen HERE or at the bottom of this article. Tom donated the entire cost of the production. 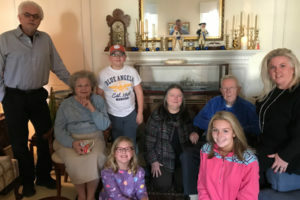 Tom Zwemke (left) with Barbara Tuttle Admiral Tuttle and other Tuttle family members. Cased model is in the background. The video includes interviews with a number of prominent supporters, including Congressman David Cicilline (D-RI); Congresswoman Martha McSally (R-AZ); and the late Gene Cernan, last man to walk on the moon. During the production Tom met and befriended retired VADM Jerry O. Tuttle and his wife Barbara. Admiral Tuttle commanded USS John F. Kennedy in 1977 and 1978. 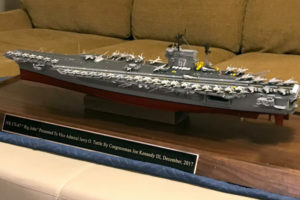 That growing friendship culminated on December 27, when Tom presented Admiral Tuttle with a 1/350 scale museum-quality model of CV-67 at the Tuttle home in McLean, Virginia. Massachusetts Congressman Joe Kennedy III supported the presentation via video. Thomas Zwemke is a Wichita-based videographer, still cameraman and video editor who has earned an Emmy award nomination and more than 25 other national awards. He is a Vietnam veteran, having served in the Newport-based destroyer Samuel B. Roberts. He later served in the Coast Guard Reserve. After graduating from Wayne State, he spent ten years in TV and radio broadcast, followed by a 30-year career with Cessna Aircraft. At Cessna he developed, directed and produced more than 500 multimedia programs for new products, working with Hollywood producers, agencies and musical talent. He produced four major documentaries, two of which aired on PBS. After retiring from Cessna he launched his own firm, and has produced annual award videos for the National Business Aircraft Association, the National Aviation Hall of Fame, and the prestigious Wright Brothers Award. 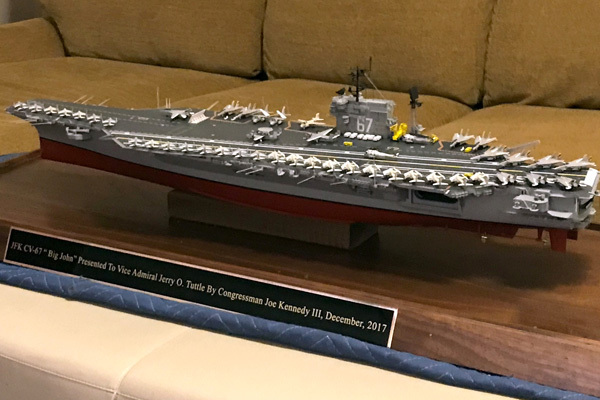 6 Responses to "JFK Videographer Zwemke Presents CV-67 Model to Admiral Tuttle"
Just shared with my hundreds of friends and families. I served proudly and honorably 1969-70. Thank you for both your support and your service, Sir! Outstanding video feature!! Congratulations on a great job! Served aboard the Kennedy on the staff of Comcrudesflot 8, Admiral Harry D. Train, Commander, during 1971-1972, leading up to and completing 10 month Med cruise. I was Admin Assistant to Flag Chief of Staff, Captain CV Merrill. I was proud then and proud now of the Kennedy and serving on her and for my country. Yeoman 2nd Class, Francis Boschi. Thank you for your kind words and your service, Sir! This video is most impressive and inspiring. As a JFK Plank Owner, I will make another contribution in good faith but want to see a definite plan. If Newport is not the anticipated birthing space, what is? Thank you for your support! We are not, at this point, ready to announce a new prospective site, but we are anticipating being able to do so within the next month or so. We will be sure to post here, on social media, and via our email newsletter.